Chairside Restorations of Esthetic Ceramic (CEREC®) has re-established dental procedures. Traditionally, if crowns, onlays, inlays or dental veneers were required to restore damaged teeth, multiple procedures and a great deal of waiting time in-between would be inevitable. 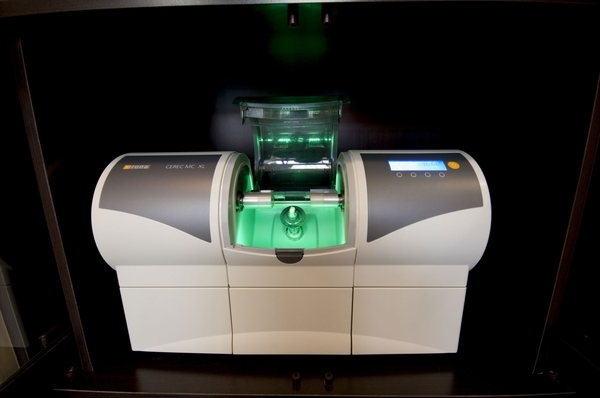 CEREC® creates these ceramic restorations within minutes in the dental office. This means that many treatments can be completed in just a single visit to our Edmonton dental office. 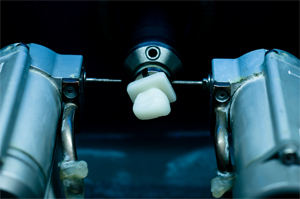 CEREC® can benefit almost anyone needing a ceramic restoration device. Exceptions include patients who have a prior history of breaking ceramic devices and those with a deep, heavy bite. 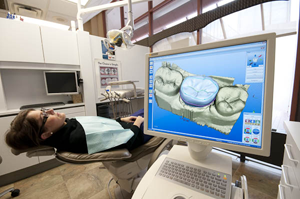 CEREC® devices are proven to last for over 5 years, but recent research indicates that most CEREC®-created restorations last for more than 10 years. Edmonton dentists, Dr. Musbah & Dr. Coulombe will remove all tooth decay and prepare the tooth for a live color streaming video capture. These images are captured with the CEREC® Omnicam, the most accurate way of transferring 3D digital imaging information to the computer and a quicker, more comfortable procedure for the patient. If you have questions about CEREC®, or if you would like to schedule an appointment, please contact our Edmonton dental office today.